Valves linear and slightly panduriform, with slightly gibbous central margin. The apices are apiculate. Narrow, lunate longitudinal ribs are present, bordering the raphe. The raphe is filiform and straight with weakly expanded proximal ends. Distal raphe ends are curved to the same side. The central area is moderately large and circular, sometimes containing isolated areolae. Striae are radiate throughout most of the valve, but parallel at the center and near the apices. Short marginal striae alternate with longer striae surrounding the central area. 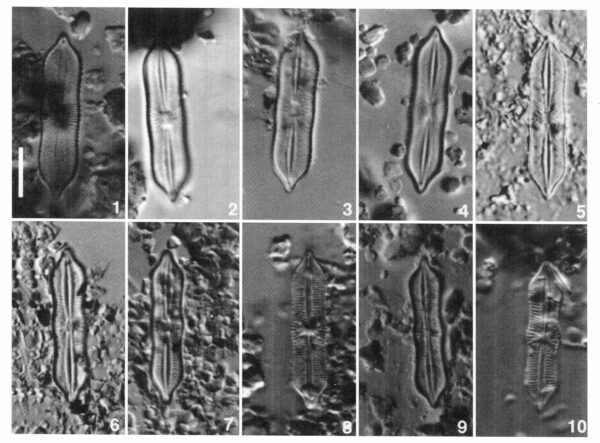 Striae are composed of fine areolae that number 30-45 in 10 µm. Areolae within each stria become more dense near the apices. Under the SEM, one to three longitudinal rows of short rounded spines occur along the valve-mantle junction. Spines in each row number about 20 in 10 µm. The valve and mantle surface are covered with small, spherical nodules. 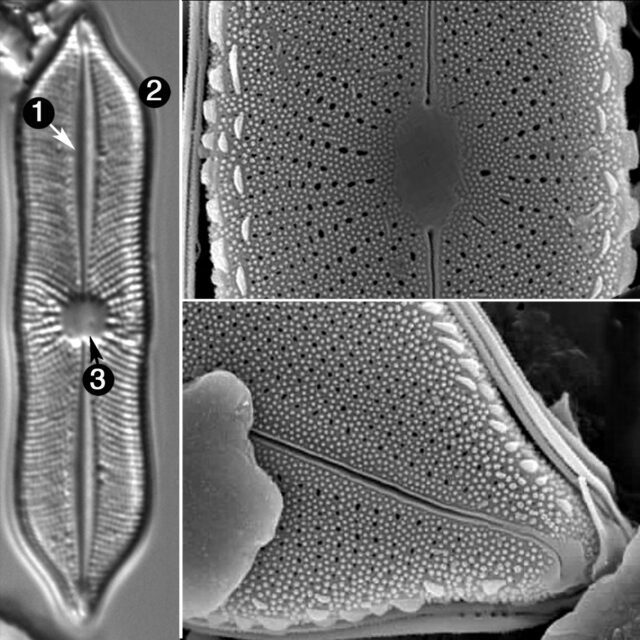 Playaensis circumfimbria was originally described from a playa lake (Peyton Lake) in New Mexico, which had a pH of 8.8 and a specific conductance of 309 µmhos. Other water quality characteristics of Peyton Lake are given by Spaulding et al. (2002). The population described here is from a small pond in southeastern Oregon (photo below). 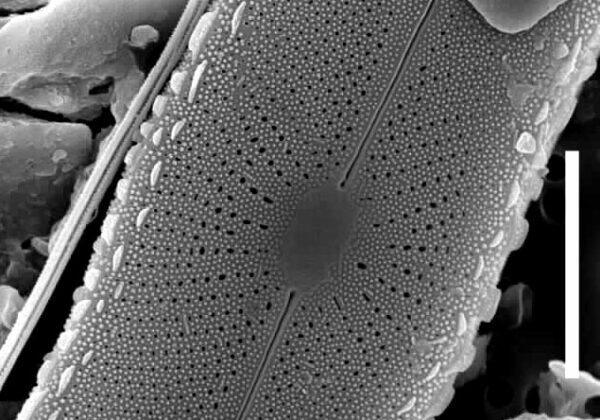 There is another record in the Montana Diatom Collection from Wild Horse Lake in north central Montana. Wild Horse Lake is an ephemeral lake on the Great Plains close to the border with Alberta and Saskatchewan. At the time it was sampled, it had a specific conductance of 917 µS/cm. 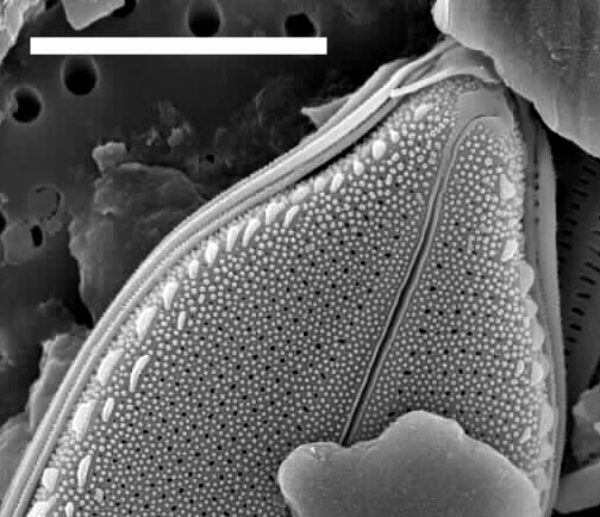 Playaensis circumfimbria was recently confirmed from an artificial pond in central Mexico (Demetrio Mora, pers. comm.). 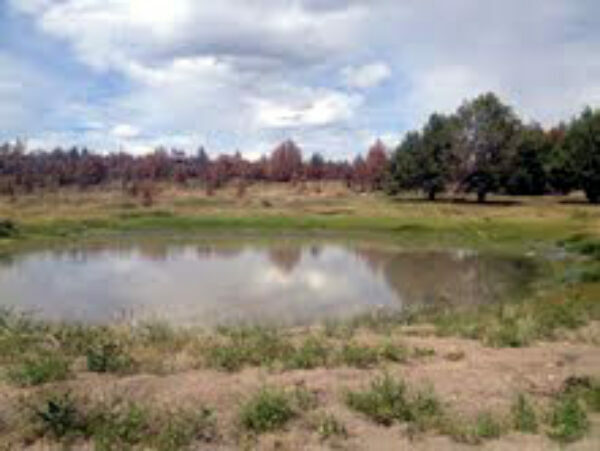 Griffith Spring Pond, Harney County, Oregon: home of Playaensis circumfimbria. 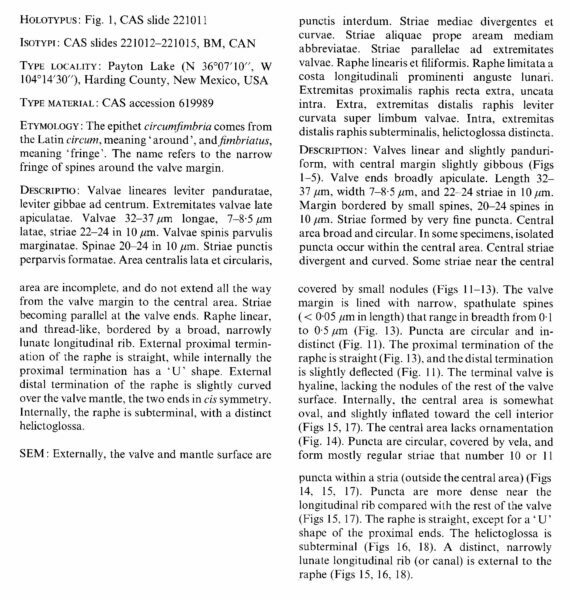 Valves linear and slightly panduriform, with central margin slightly gibbous (Figs 1-5). Valve ends broadly apiculate. Length 32-37 µm, width 7-8.5 µm, and 22-24 striae in 10 µm. 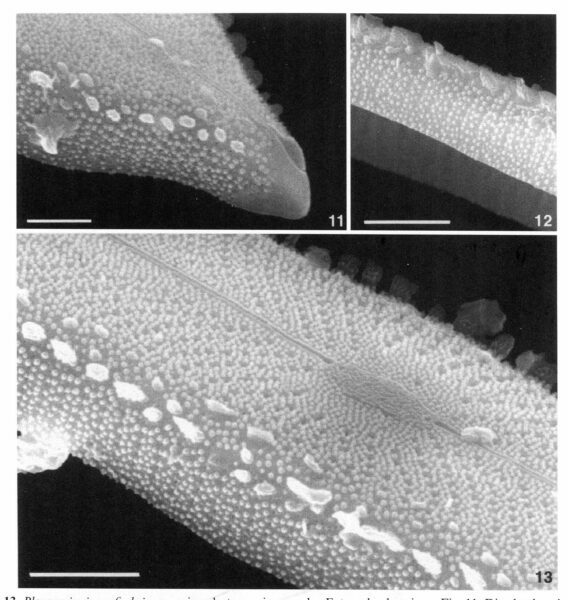 Margin bordered by small spines, 20-24 spines in 10 µm. Striae formed by very fine puncta. Central area broad and circular. In some specimens, isolated puncta occur within the central area. Central striae divergent and curved. Some striae near the central area are incomplete, and do not extend all the way from the valve margin to the central area. Striae becoming parallel at the valve ends. Raphe linear, and thread-like, bordered by a broad, narrowly lunate longitudinal rib. External proximal termination of the raphe is straight, while internally the proximal termination has a 'U' shape. External distal termination of the raphe is slightly curved over the valve mantle, the two ends in cis symmetry. Internally, the raphe is subterminal with a distinct helictoglossa. 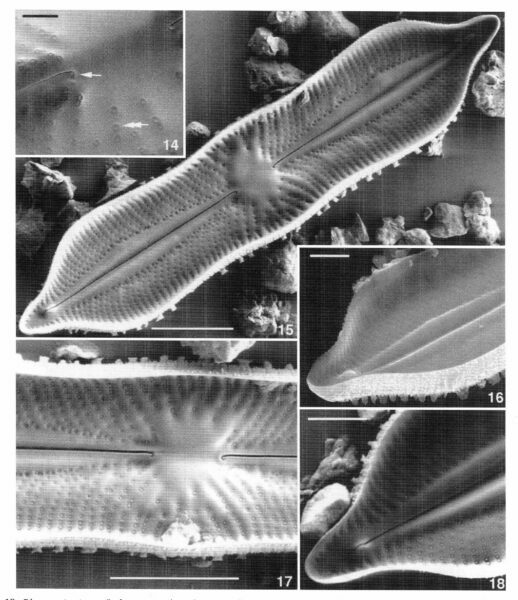 Playaensis circumfimbria has small panduriform valves with a slightly gibbous central margin. The apices are apiculate. The central area is relatively large and circular. Distinct longitudinal ribs are present.